Here isSome Information about Deo Somnath Temple in Dungarpur Rajasthan India. Deo Somnath Temple is a located at a distance of 24 km away from Dungarpur at Deo Gaon. 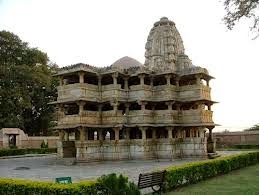 Situated on the banks of the River Som, it was constructed during the rule of Vikram Samwat in the 12th century.The temple is Dedicated to Lord Shiva.The temple is believed to have been built sometime in the 12th century of Vikram Samwat. Built in white stone, the temple has imposing currants. It gives an impression of the antiquity. 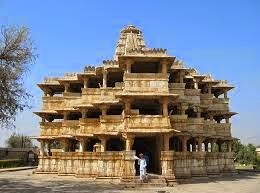 There are several inscriptions in the temple.An amazing banyan tree which must be hundreds of years old also attracts attention.This stone temple is an exact replica of the original Somnath Temple in Gujarat. Invaders from across the western borders of India, the first being Mahmud of Ghazni in 1025, repeatedly plundered the original temple, carrying away its vast treasures. The fear of further destruction by the invaders led the devout and devoted Hindus to build a duplicate copy in the inland. The Deo Somnath Temple also resembles one of the stone temples at Khajuraho in Madhya Pradesh. The temple has a massive elephant carved out of stone at its entrance and a stone Nandi (Lord Shiva’s bull) faces the main shrine. The temple walls have panels of handprints perhaps of the women who immolated themselves as sati. Sati comes from the Sanskrit word satya or truth, which is attributed to a woman who has followed the right and virtuous path by immolating herself on the funeral pyre of her husband. 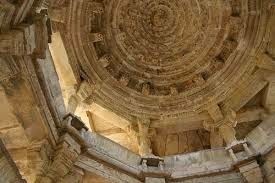 The ceiling of the corbelled dome is a fine piece of architecture resembling the ceilings of the Jain temples in Ranakpur. It is an exquisite example of the complexities and delicacies of stone carving. The pillars are carved with various patterns, the walls with their panel of sculpted figures, stuccos and several inscriptions all add to the charm of this ancient temple. By Road : Deo Somnath Temple is located at Deo Gaon, 24 km north east of Dungarpur district. One can easily reach here by bus or taxi. By Rail: The Nearest Railway station is Dungarpr Railway station. 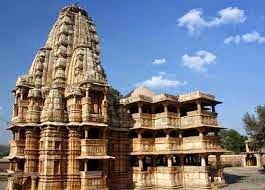 By Air : The Nearest Airport is Deo Somnath Temple can be reach through nearest Udaipur Airport which is well connected with regular domestic flights to Delhi, Kolkata, Mumbai, Ahmedabad, Jodhpur and Jaipur.